With the Clarke CA30 17E, you can experience the agility of a 17 inch wide auto scrubber and the added convenience of a 65 foot safety yellow power cord. This machine will improve your cleaning productivity by putting solution down, scrubbing your floor, and recovery that dirty solution all in one pass. Engineered for heavy daily use in a variety of commercial applications, the CA30 17E features a heavy-duty cast aluminum assembly that houses a rounded squeegee assembly that delivers a quick, complete solution pick-up day in and day out. 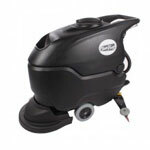 The brush assist drive on this auto scrubber makes it extremely easy to use in any situation. Very little effort is needed to push the scrubber along as it cleans. The front mounted brush or pad driver will literally pull the machine along as the head turns. Great for users with entry level floor scrubbing needs. 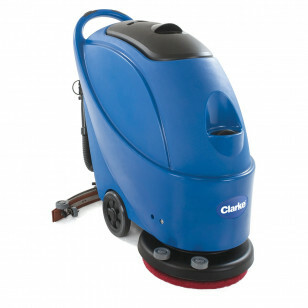 Clarke has established themselves as an industry leader with over 100 years experience in manufacturing cleaning machines. The full line of Clarke auto scrubbers come backed by a 5 year warranty on parts, 2 years on labor and 180 days for travel. Ships for free to any commercial or residential address in the continental U.S.
Best value in the industry with easy-to-use fingertip controls. Long, 65 foot safety yellow power cord for non-stop cleaning. Engineered to withstand heavy daily use in commercial applications including schools, office buildings & medical facilities. Pad driver & heavy-duty cast aluminum squeegee assembly included. High cleaning productivity rate is up to 5 times faster than traditional mop & bucket systems.